Compton, L.K.L., Davis, N. & Mackey, J. (2009). Field Experience in Virtual Schools—To Be There Virtually. Journal of Technology and Teacher Education, 17 (4), 459-477. Waynesville, NC USA: Society for Information Technology & Teacher Education. Retrieved April 20, 2019 from https://www.learntechlib.org/primary/p/28316/. Albion, P., & Gibson, I. (2000). Problem-based learning as a multimedia design framework in teacher education. 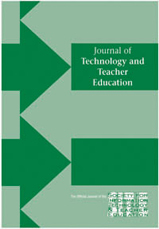 Journal of Technology and Teacher Education. 8(4), 315-326. Barbour, M., Kinsella, J., Wicks, M., & Toker, S. (2009). Continuing change in a virtual world: Training and retraining teachers [Special issue]. Journal of Technology and Teacher Education, 17(4), 437-458. Barbour, M. K., & Reeves, T. C. (2009). The reality of virtual schools: A review of the literature. Computers & Education, 52(2), 402-416. Cavanaugh, C. S. (2001). The effectiveness of interactive distance education technologies in K-12 learning: A meta-analysis. International Journal of Educational Telecommunications, 7(1), 73-88. Charania, A. (2009). Preservice teachers’ perspectives on virtual schooling. Manuscript in preparation. Compton, L. (2009). The impact of key elements for a successful virtual early field experience: Lessons learned from a case study. Manuscript in preparation. Compton, L., Follett, J., & Demiraslan, Y. (2007). Challenging preservice teachers’ preconceptions, misconceptions, and concerns of virtual schooling: A preliminary analysis. Davis, N. E., & Niederhauser, D. S. (2007, May). New roles and responsibilities for distance education in K-12 education. Learning and Leading, 34(7), 10-15. Esterberg, K. G. (2002). Qualitative methods in social research. Boston: McGraw Hill. Ferdig, R., Cavanaugh, C., DiPietro, M., Black, E., Mulkey, J., & Dawson, K. (2009). Virtual schooling standards and best practices for teacher education [Special issue]. Journal of Technology and Teacher Education, 17(4), 479-502. Ferdig, R. E., Roehler, L. R., & Pearson, P. D. (2006). Video and database-driven web environments for pre-service literacy teaching and learning. In M. C. McKenna, L. D. Labbo, R. D. Kieffer, & D. Reinking (Eds. ), International handbook of literacy and technology (Vol. 2, pp. 235-256). Mahwah, NJ: Lawrence Erlbaum. Hannum, W.H., Irvin, M.J., Lei, P.W., & Farmer, T.W. (2008). Effectiveness of using learner-centered principles on student retention in distance education courses in rural schools. Distance Education, 29(3), 211-229. Harms, C. M., Niederhauser, D. S., Davis, N. E., Roblyer, M. D., & Gilbert, S. B. (2006). Educating educators for virtual schooling: Communicating roles and responsibilities. Electronic Journal of Communication, 16(1-2). Knowles, J. G., & Cole, A. L. (1996). Developing practice through field experiences. In F. Murray (Ed. ), The teacher educator’s handbook. Building a knowledge base for the preparation of teachers. San Francisco: Jossey-Bass. Lai, K.W., & Pratt, K. (2009). Technological constraints and implementation barriers of using videoconferencing for virtual teaching in New Zealand secondary schools [Special issue]. Journal of Technology and Teacher Education, 17(4), 503-520. McIntyre, D. J., Byrd, D. M., & Foxx, S. M. (1996). Field and laboratory experiences. In J. Sikula, T. Buttery, & E. Guyton (Eds. ), Handbook of research on teacher education (pp. 171-193). New York: Macmillan. Morine-Dershimer, G., & Leighfield, K. (1995). Student teaching and field experiences. In L.W. Anderson (Ed. ), International encyclopaedia of teaching and teacher education (pp. 588-593). Oxford, UK: Elsevier. Roblyer, M. D. (2008). Virtual schooling: Redefining a place called “school.” In J. Voogt & G. Knezek (Eds. ), International handbook of information technology in primary and secondary education. Amsterdam, The Netherlands: Springer-Verlag. Wenmoth, D. (2005, January). The New Zealand correspondence school and the video conferencing cluster schools network. Paper presented at the International Conference on Open Schooling, Goa, India. What Do Teachers Learn About Online Learning from Their Online Professional Development Experiences?